TAGBILARAN CITY, Bohol – Davao City Mayor Sara Duterte on Wednesday once again introduced Marinduque Rep. Lord Allan Velasco as the person who will succeed outgoing House Speaker Gloria Macapagal Arroyo. Duterte’s announcement came a day after she introduced former Leyte Rep. Ferdinand Martin as “the next Speaker of the House of Representatives” in Tacloban City. “Bago po ang lahat, nais ko po munang i-acknowledge ang presence ni Cong. Lord Allan Velasco, ang susunod na Speaker of the House,” said the Presidential daughter while raising the hand of the Marinduque solon. This is the second time the Davao City mayor introduced the son of retired Supreme Court (SC) Associate Justice Presbitero Velasco as the next House Speaker. Last November, Mayor Duterte and her father President Duterte introduced Velasco as the potential successor of Arroyo this coming July during two separate events held in the legislator’s home province. 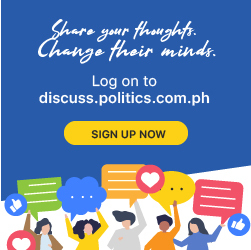 Velasco, chairman of the House committee on energy, earlier disclosed that the battle for Speakership in the upcoming 18th Congress was still up for grabs to any supporter of President Duterte.